We can start this discussion as a tale of two springs in the Bristol Mountains. This is in the Mojave Desert near Ludlow California. The society has covered these two water sources with the photo survey for some time. Though they are only a mile apart and both have good escape terrain, the sheep use them very differently. The first one we can call East spring it is rarely used, perhaps only two or three times a month, and mostly by mature rams. The second one We can call West spring is used a lot more. Anywhere from 20 to 30 sheep depend on this water source and of the 4 or 5 other water sources in this mountain range, spring West spring is by far the most important. For a long time this was a mystery to me. Then one day I was walking around the area of West spring I noticed a small area that had a lot of sheep tracks and you could see where they were converging on a small light-colored patch of dirt. It was a natural mineral lick. A while later, with this fresh in my mind, I walked up the main wash and was only about 200 yards from West spring when I noticed a larger area that the sheep had been using as a mineral lick. So I set up a trail camera and was able to get pictures of sheep using this natural mineral lick. This of course explained the difference in use between these two water sources, as well as shedding light on the use pattern of the other water sources in this mountain range. Now fast-forward a year or so. I went to look at the newly installed drinker in the Newberry springs area at the old quarry site. Looking around I noticed only 50 yards away in an area that was still in its natural state, another mineral lick that had been used quite extensively. So I came back a few days later and actually got some video of sheep using both the water and the mineral lick and I spotted other licks in the area. This got me thinking about how this might play into the natural history of bighorn sheep and their water sources in the Newberry Mountains. We can start with Newberry Springs. The spring is only about a mile away from the quarries water/mineral lick. This named natural water source has been unavailable to bighorn sheep for over a century because of human presence and the fact that it’s now completely dry, this spring, when it was available to them, had a mineral source right next to it in the form of a small depression perhaps 10 or 15 acres that has a salty alkali soil. The minerals and salts of this depression would have washed down from the very sources that the sheep are using today. So it is that the modern quarries water/mineral lick mimics the original and natural environment very closely, and leads to a more natural distribution and internal biology of this herd. Then there’s New Springs. It is approximately 4 miles away. I’ve watched and maintained this spring since the mid-1980s. It was part of our camera survey for several years. In that time the desert bighorn seem to use the spring once or twice a week in the summer months and it produces a fair amount of water and is never dry. Next there is Kane Springs. This spring has been producing water since ancient times and has been improved for the use of cattle. I have known and watched the spring for many years. It has been part of our photo survey and we’ve collected a lot of data there. It seems that this spring is used by bighorn sheep in an erratic manner some years more than others. It is about 5.2 miles from the quarry water/mineral lick. Next there is BBG 25 it was built in 1986 and I helped choose its location. It is about 3 miles from the quarry water/mineral lick. I watched and maintained it as the area captain from its construction to the year 2000, when I start wandering more widely across the Southwest. In those first 14 years I don’t think a single bighorn sheep ever drink from it. Most the time it had water. This was always puzzling to me. The guzzler is in a beautiful little canyon that is very isolated and quiet, perfect escape terrain and some of the best vegetation in the Newberry Mountains. When you got 200 or 300 yards away from it, there was sheep sign, not a lot, but the bighorn sheep were there. Then sometime in 2008 I heard that the people who were working the Newberry quarry were seeing a lot of sheep and they had put out some water out for them. So I went to investigate. It was everything that BBG 25 was not. To start with the water was near a paved road and a large noisy conveyor belt that hauled rock. Also in this area there was a rock crusher and a considerable amount of blasting was going on regularly. Yet looking around at all the tracks and droppings at this water source I could see that there was a fair number sheep here and they were using this water constantly. At this time I did not notice the mineral lick. I wish I had. Because of this I thought it would be worth looking at BBG 25 to see if things had changed, since it had been several years since I’ve been there. When I got there I was surprised to see tracks and droppings everywhere and even beds near the guzzler. The place smelled like a stockyard. I found this to be interesting and worth investigating more. My first thought was that the population had shifted from Ord mountain down to this area perhaps due to some unusual weather pattern, such as a year or two with thunderstorms hit the Newberry mountains and not Ord mountain. So I spent two or three days walking Ord mountain. To my surprise there was more sign of desert bighorn sheep on Ord mountain than I had ever seen before. So I did some walking in the Rodman Mountains and the West Ord mountains. 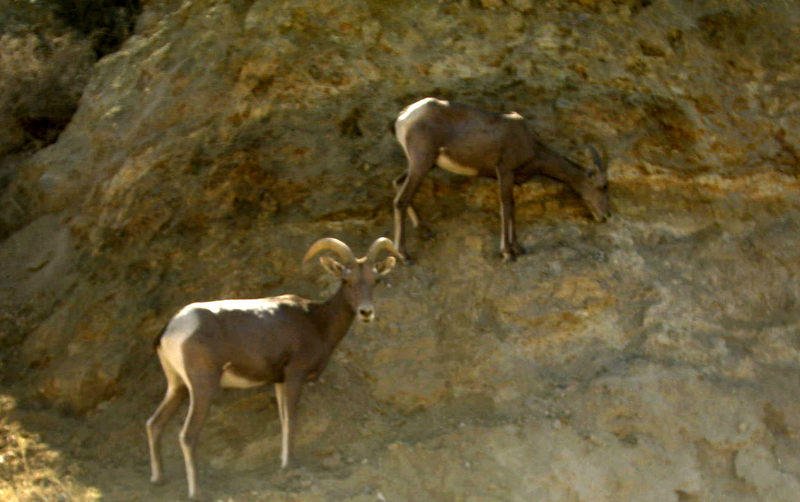 They all showed a significant increase in bighorn sheep activity. So I came to the conclusion that there had been a significant increase in the population of bighorn sheep in this area. This had occurred in the seven or eight years that had elapsed since I walked these mountains regularly. While there is no hard data on this subject it is my opinion that this population easily doubled and more likely tripled in that timeframe. I realize that for people who deal with bighorn sheep this would seem a bit too much but I stand by this estimate. Of course at the time, I had no idea why. I had not yet noticed the mineral lick at the quarry. From 2008 onward the population seems to have been stable and spreading. Judging from the trail cameras this herd seems to be very healthy. Given all this, here are some thoughts and observations on the subject of desert bighorn sheep water and natural mineral licks. The fact that large herbivores will often go to great extent to get to the right salt or minerals is nothing new. I have witnessed this myself once in the Canadian Rockies I saw place where stone sheep walk through more than a mile of dense forest to get to a salt lick. Another time in Africa I saw a place where the elephants would bash their way through a mile or two of jungle to get to a salt/mineral lick that had a small perennial stream by it. So the importance of salt or mineral source for desert bighorn sheep is not the question here. What is needed now is a species specific knowledge about the relationship of water and mineral sources. With this in mind, those of us in the Desert Bighorn Sheep community can see that the story that took place at the quarry in the Newberry Mountains is a familiar one. It’s happened many times that desert bighorn sheep seem to hang around golf courses swimming pools and operating mine or quarry in spite of all the noise and human activity that’s going on there. It may be this combination of water and minerals, sometimes in the form of “crushed rock” that is the key to understanding this phenomena. On a related phenomena I have observed in the Newberry Mountains that the desert bighorn sheep in this range do not use the salt blocks put out by the cattlemen. Perhaps other people have observed something different but this is my observation in the Newberry Mountains that goes back many years. Perhaps this issue should be studied so that can be understood and managed from a knowledgeable position. If we take stock of what’s going on at some of these mines and quarries and golf courses we may find some information that is valuable to understanding and maintaining the overall health of the species. These situations seem to indicate the importance of having the right minerals close to a water source. I think the history of the Newberry quarry backed up by the Society for the conservation of bighorn sheep photo survey indicates this. People who know Desert Bighorn Sheep generally do not think that a place 2 or 3 miles from a spring is very far considering the distances that desert bighorn will go when they want to. But when it comes to the utilization of minerals perhaps we should rethink this idea. Another thought or idea that should be considered is manipulating the habitat utilizing minerals. There are many ways that this could be done. Perhaps one of the most simple and straightforward ways to do this Is to find a place where the sheep are using a natural mineral source, and take a truck load of this dirt to another spring or guzzler then see what happens. Using some of the modern surveillance tools available to us, such as trail cameras and radio callers could give us a precise and useful knowledge of this relationship. Doing investigations like this will also give us more mineral sources to analyze and thereby learn what minerals or nutrients the desert bighorn sheep are going after and need. It is also possible that we may find that some of these water mineral licks do more damage than good, due to such things as mercury and arsenic. In time will have developed a species and site-specific knowledge of water/mineral sources. Then with this thorough understanding of the water mineral relationship our society would have a useful insight of how this issue has affected such things as disease propagation and control, and why some herds have survived and others have not, and metapopulation distribution. In doing so I think that will find that certain Springs that are thought of as “popular” to desert bighorn sheep are in fact crucial to their survival and are actually a “water/mineral resource” and perhaps this nomenclature will become part of the lexicon of desert bighorn sheep management. Knowledge is the building blocks of wisdom. For someone wanting to understand the ecology of the desert southwest, a detailed knowledge of the Pinon Pine tree is an excellent place to start.